Sherry"s Stamped Treasures: Get This Tote for FREE! Get This Tote for FREE! Isn't this tote gorgeous?! I love the Greenhouse Gala DSP and was so excited when I saw this bag and a coordinating laptop bag at Convention this past summer. It's amazing how much it will hold and would be a fabulous addition to your stamping or scrapbooking supplies. What a handy way to carry all your tools and supplies with some style! Perfect for the hobby or career demonstrator on the go. Are you curious how you can get this absolutely FREE (value of $49.95)?! When you purchase either of Stampin' Up! 's starter kits (check out the kit details here), they will send it to you absolutely FREE! But only until October 18th or while quantities last. You don't want to miss out on this fabulous freebee added on to an already great starter kit deal! There's no better time than now to start filling your wish list and SAVE 30%. 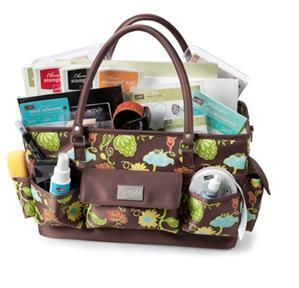 In addition to the free craft tote shown above, purchasing the Starter Kit and joining the Stampin' Up! family earns you a one-time "bonus" of 30% off a Stampin' Up! product order of $200 or more (placed within 60 days of starter kit purchase). What a perfect way to fill your Stampin' Up! wish list just in time to get some Christmas gifts, and the supplies needed to create your cards and gift ideas! PLUS, you'll receive everyday demonstrator discounts and benefits and become a member of my Treasure Stampers team. Whether you are interested in earning extra money for Christmas, a car payment, monthly bills, want to save for a holiday, or if you just love to paper craft , I welcome both hobby crafters and business demonstrators to my team. If you are interested in more information, I'd be happy to answer any questions and/or send you more information. If you are ready to sign up now, email me and I will provide you with the password to sign up online so you can start taking advantage of all the great benefits of being a Stampin' Up! demonstrator.